1. Fenaux, P.; Chomienne, C.; Degos, L. Acute promyelocytic leukemia. Biology and treatment. Semin. Oncol. 1997, 24 (1), 92-102. 2. Huang, M.E. ; Yc, Y.C. ; Chen, S.R. ; Lu, M.X. ; Zhoa, L.; Gu, L.J. ; et al. Use of all-trans retinoic acid in the treatment of acute promyelocytic leukemia. Blood 1988, 72 (2), 567-572. 3. Castaigne, S.; Chomienne, C.; Daniel, M.T. ; Berger, R.; Fenaux, P.; Degos, L. All-trans retinoic acid as a differentiation therapy for acute promyelocytic leukemia: I. Clinical results. Blood 1990, 76 (9), 1704-1709. 4. Warrell, R.P., Jr.; Frankel, S.R. ; Miller, W.H., Jr.; Scheinberg, D.A. ; Itri, L.M. ; Hittelman, W.N. ; Vyas, R.; Andreeff, M.; Tafuri, A.; Jakubowski, A. Differentiation therapy for acute promyelocytic leukemia with tretinoin (all-trans retinoic acid). N. Engl. J. Med. 1991, 324 (20), 1385-1393. 5. Brunning, R.D. ; McKenna, R.W. Acute Leukemias. In Atlas of Tumor Pathology. Tumors of the Bone Marrow; Armed Forces Institute of Pathology: Washington, DC, 9. 1994; 119-142. 6. Diverio, D.; Rossi, V.; Avvisati, G.; De Santis, S.; Pistilli, A.; Pane, F.; Saglio, G.; Martinelli, G.; Petti, M.C. ; Santoro, A.; Pelicci, P.G. ; Mandelli, F.; Biondi, A.; Lo 10. Coco, F.L. Early detection of relapse by prospective reverse transcriptase-polymerase chain reaction analysis of the PML/RARAlpha fusion gene in patients with acute promyelocytic leukemia enrolled in the GIMEMA-AIEOP multicenter ''AIDA'' trial. GIMEMA-AIEOP multicenter 11. ''AIDA'' trial. Blood 1998, 92 (3), 784-789. 7. Diverio, D.; Pandolfi, P.P. ; Rossi, V.; Biondi, A.; Pelicci, P.G. ; Lo Coco, F. Monitoring of treatment outcome in acute promyelocytic leukemia by RT-PCR. Leukemia 12. 1994, 8 (Suppl. 2), S63-S65. associated transcript during consolidation chemotherapy. Haematologica 1998, 83 (11), 985-988. Lo Coco, F.; Diverio, D.; Avvisati, G.; Mandelli, F. Diagnosis, front line treatment and molecular monitoring of acute promyelocytic leukaemia. Haematologica 1999, 84 (Suppl. EHA-4), 72-74. Tobal, K.; Saunders, M.J.; Grey, M.R. ; Yin, J.A. Persistence of RAR alpha-PML fusion mRNA detected by reverse transcriptase polymerase chain reaction in patients in long-term remission of acute promyelocytic leukaemia. Br. J. Haematol. 1995, 90 (3), 615-618. Wang, Y.L. ; Bagg, A.; Pear, W.; Nowell, P.C. ; Hess, J.L. Chronic myelogenous leukemia: Laboratory diagnosis and monitoring. 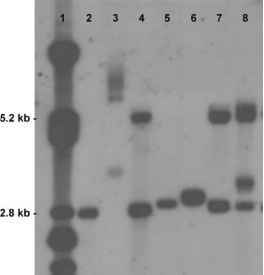 Genes Chromosomes Cancer 2001, 32 (2), 97-111. College of American Pathologist Surveys. Fluorescence In-Situ Hybridization Survey—Participant Summary; 1999. Borrow, J. Diagnosis of acute promyelocytic leukemia by RT-PCR: Detection of PML-RARA and RARA fusion transcript. Br. J. Haematol. 1992, 82 (3), 529 -540.